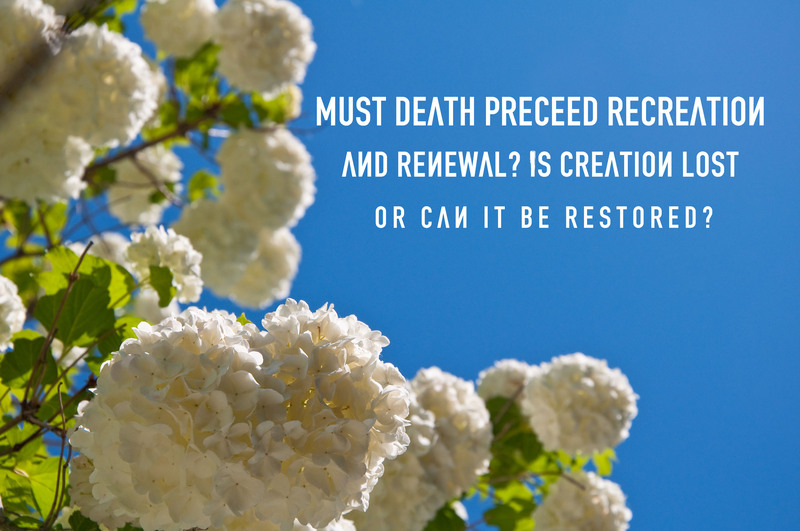 Must death preceed recreation and renewal? Is creation lost? There is this conflict within the christian community as how the recreation of the world will take place. One side believes that all of creation will be destroyed. Then God will form again from nothing a new created world. The other side believes that this created world will not be destroyed merely recreated. God created this world “good,” loves this world, and does not and will not ever destroy it. But the day of the Lord will come like a thief. The heavens will disappear with a roar; the elements will be destroyed by fire, and the earth and everything in it will be laid bare. Since everything will be destroyed in this way, what kind of people ought you to be? You ought to live holy and godly lives as you look forward to the day of God and speed its coming.That day will bring about the destruction of the heavens by fire, and the elements will melt in the heat. But in keeping with his promise we are looking forward to a new heaven and a new earth, the home of righteousness. Sin has completely corrupted the world, beyond saving. Both mankind, and all of creations was changed beyond return because of mans sin. Therefore God, must destroy the old to bring forth the new. There must be death before recreation. *This would seem true, but not all believers will die before receiving their resurrection bodies. Those who are alive at the time of Jesus’ return will just be transformed. Creation was distorted and pulled down because of man’s fall into sin. God does not need to destroy creation to restore it. He knew man was wicked, yet when man is restored then creation will be freed from the effects on sin. Man’s sin is what is keeping creation from being how God has intended it, paradise. Once sin is removed creation will be restored. Man’s corruption is the issue not creation. Creation is only a tool that God uses to both bless and punish. Blessings: fruit of the land, provision, beauty. Punishment: Toil the land, natural disasters, sickness.